This trip gave me a reason to replace the 25-year-old bike of my son’s that I had been riding and buy something a bit better. The difference was huge. I live at the top of a significant hill that I had not made it up by bike for years. First try this year on the new bike and up I went. It was well worth the $300 I spent. The bike was second hand. It wasn’t that long ago that biking Ontario meant many hills and few paved shoulders. 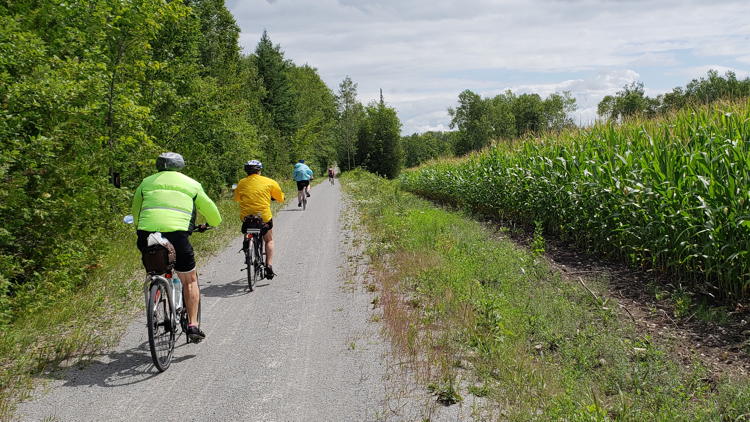 Now, with the rail trails, just about anyone can bike Ontario. In July, I took a weekend tour with Ontario by Bike. 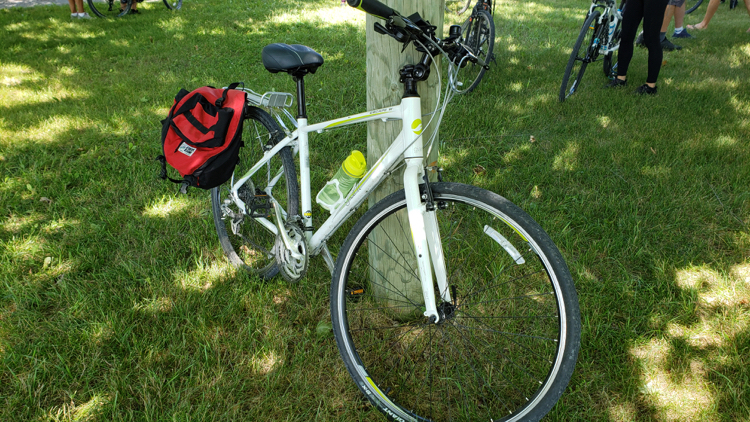 The ride went from Uxbridge, northeast of Toronto to Lakefield, northeast of Peterborough. 100 km in all and most of it was along rail trails. Before going, I didn’t know what the rail trails were like but I had a general idea of the very hilly terrain that would be covered. I was concerned about those hills. At check-in, I expressed a little anxiety and was quickly relieved of it. The trails that cover the old rail beds never have grades of more than 3%. This is because rail transportation was inefficient with a higher grade. These gentle slopes certainly make cycling in Ontario more efficient as well. Check-in at Uxbridge where I was relieved of my worry about hills. One doesn’t have to be a high performance athlete to be exhilarated by taking on a challenge. Cycling 100 km in two days may not be medal-worthy, it may not warrant an athlete’s scream of success, but for me it was a big deal. It made me feel strong and capable. Ready to take on more. And the group on the tour was a big part of it. A bike trip to the UK was my first trip without my family. I was fifteen. I went cycling for a month with a group of students led by a teacher. It was a trip that entered my identity yet I’ve only done a few since. Yes, I use my bike to get around Toronto quite a bit but it’s been a while since I’ve done any touring. In a sense, I returned to my roots on this trip, though this tour was only 2 days long. Before going, I wondered who would be on the tour. Would I be the only solo? It turned out that there were maybe a half dozen others who were singles. There were also couples, a group of four friends, and even a family. Cycling can be a communal activity. I rode with different people at different times on the trip. People naturally fell into a lead group, a middle group, and a more leisurely group that brought up the rear. There was a sweep, of course. This is a person who rides at the very end to make sure no one has a problem alone. There was also a van that followed our route, bringing us lunch and snacks along the way and taking all the bikes back to the starting point at the end of the trip. Forty-five kilometers on the first day. Check! Plus a ride to enjoy a famous Kawartha Dairy ice cream in Lindsay and then a walk with the group for dinner at the Olympia Restaurant on Kent Street. A great night’s sleep and then up for breakfast with the group and continuing on. On day two there were 40 km to ride before lunch in Peterborough. And then that last 15 km (optional) to Lakefield. Before the trip I wasn’t sure that I could do the additional 15 km as I had never done more than 35 km two days in a row before. But without steep hills, it was doable. I made it and felt great. Unfortunately, all the tours by Ontario by Bike are sold out for the rest of this season. However, I will be notified when they release the 2019 schedule in February and I’ll let you know. The price for the tour was $239 for the weekend including all snacks and meals except Saturday night dinner, van support, luggage transportation, guides and sweep. They offer room sharing if you want to avoid the single supplement. If you want your own room there is a supplement. I trained for this trip. If you’re interested in how, read Training for Travel: Preparing for Demanding Trips. The weather was dicey on the Saturday. We had rain on and off. We crossed two trestle bridges. This one was 70 feet high and had great views. Rob, another rider, kindly braved the slope beside the bridge to take this photo. We were a happy crew! 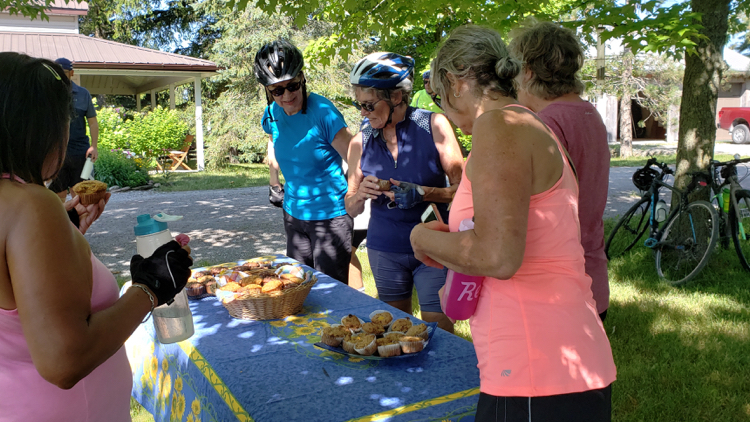 We were welcomed with freshly-baked muffins at the home of a couple who are ambassadors of The Great Trail. Towards the end of the second day of riding, after pushing it a bit to make it in a respectable time, I slowed down to savor the ride in the quiet of my own thoughts. 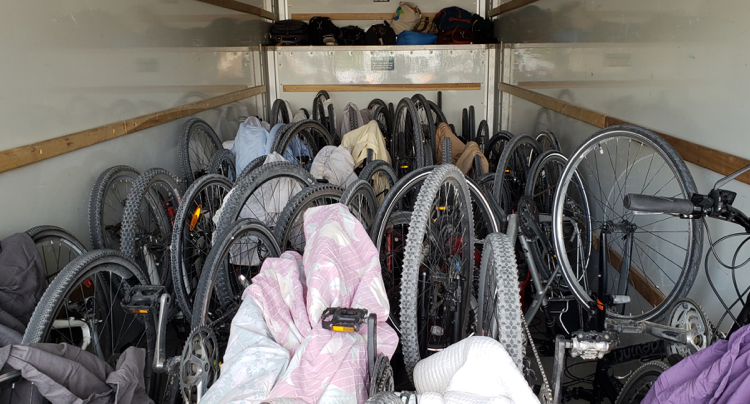 All bikes packed in and ready to return to our starting point. A bus took the riders. 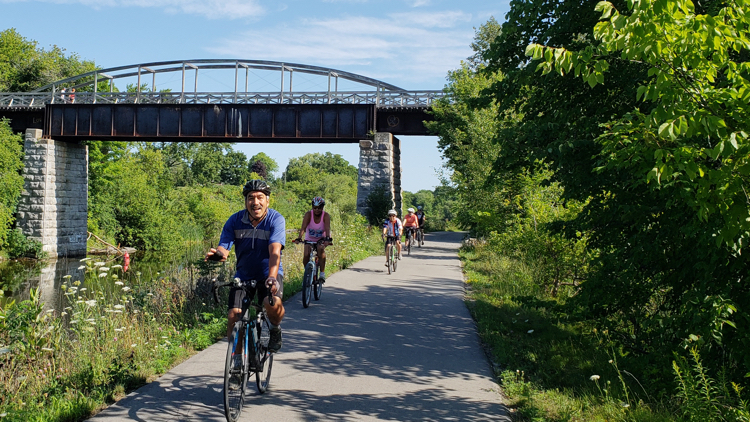 Ontario by Bike, the organizers of the ride I took, is a non-profit organization that offers everything you could possibly want to enjoy cycling in Ontario from routes to accommodation to breweries along the way. They don’t hold back. Detailed itineraries of all their rides are on their site so you have an option. You can join one of their tours as I did or you can download and follow their itineraries. Toronto Trails & Ravines Ride – 90 km – 2 Days, 1 overnight Itinerary. 1000 Islands St. Lawrence River Ride – 158 km – 3 Days, 2 overnights Itinerary. Georgian Bay Explorer – 95 km – 2 Days, 1 overnight Itinerary. 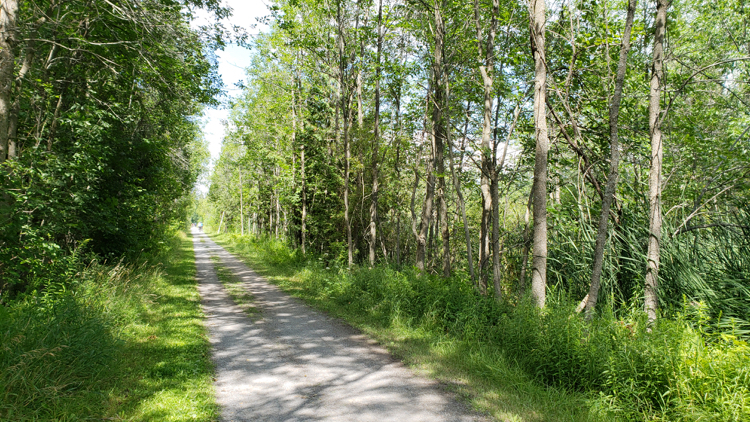 Simcoe County Rail Trails – 108 km (or 145 km) – 2 Days, 1 overnight Itinerary. Niagara Circle Route South – 118 km – 2 Days, 1 overnight Itinerary. Hamilton Brantford Paris Port Dover Rail Trail- 95 km to 135 km – 2 Days, 1 overnight Itinerary. This is the route I took along the rail trails from Uxbridge to Lakefield. 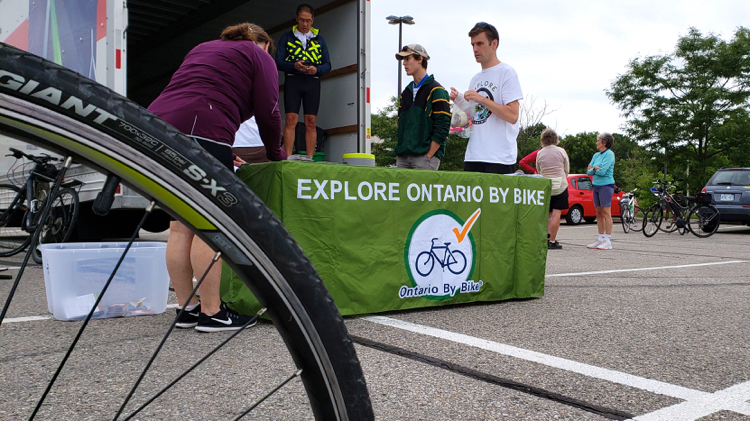 You can find cycling itineraries on the Ontario by Bike site. The itineraries also offer you links to digital maps. 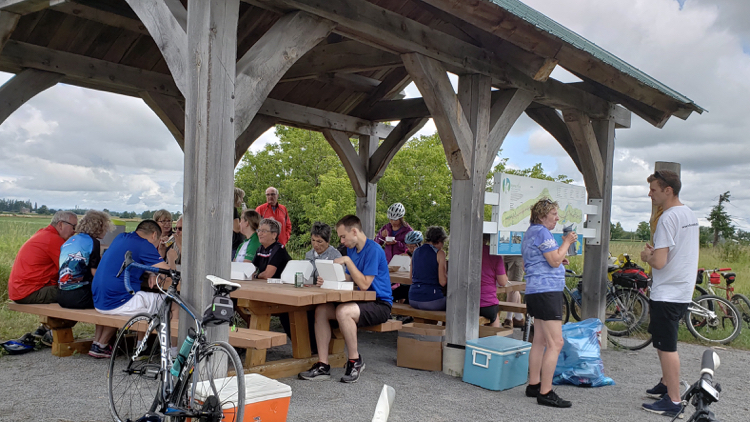 The itineraries for biking Ontario that you’ll find in the section above are great whether you’re going on one of their tours or you use them to cycle solo. If you’re doing the latter, here are some tips for cycling alone. Ride a bike you’re confident in and on. Before heading out on a tour farther than a few miles from home, it’s wise to spend some time on the bike so that you’re comfortable on it. If you don’t know how to adjust the seat, go to a bike shop that will help you. Get familiar with the sensitivity of your brakes and the gear system and the range of gears you’re most comfortable with in various circumstances. Safety gear. Lights and reflectors on your bike, bright clothing and, of course, a helmet are all key safety gear for cycling. Stay close to home. If you’re planning a long ride, map out a route that doesn’t take you too far from home. 40 km away and 40 km back could be 15 km away and circles back that give you 80 km without ever getting too far from home. Or, at least, stay close to civilization. While being far from civilization may be appealing, seeing a person now and then can be reassuring. Stick to trails and roads that are used by others. Trails first, roads with paved shoulders second. Know your priorities when cycling. 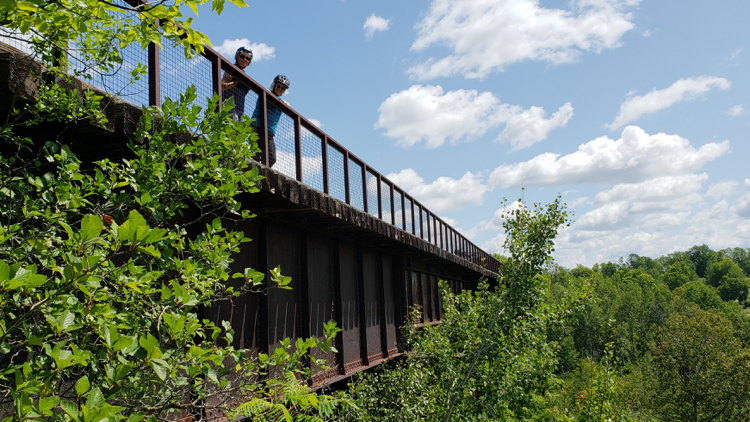 Trails that are designed for touring, like the rail trails that are all over North America, are wonderful and safe since you’re not competing with any traffic. If you’re planning on road biking, check to make sure that your route has a decent paved shoulder. If a road does not have a paved shoulder, limit the amount of time you’ll be on it. Carry ID and emergency information. Just in case something happens and you’re not able to speak for yourself, make sure that you’re carrying identification and information on who to contact in case of an emergency. Carry a charged mobile phone. A mobile phone is now a basic safety device for any sort of travel. Have your phone charged and with you in case you need support. Basic repair kit. You can do a lot of riding in one gear, with one set of brakes or with a missing pedal, but a flat tire is almost impossible to ride with. At minimum, carry a small repair kit and pump. Water, sun block, energy bars, rain gear. You don’t need to carry a lot as you travel but some basics in case the weather changes or you take longer to reach your destination than planned are a good idea. Have communication options. Carrying your charged phone with you on a cycling trip is the easiest way to stay in touch when traveling solo. If, however, you are cycling somewhere where it is unlikely that you’ll have service, using an app such as Close Circle, which has a tracker and SOS service among its features, is a good idea. Thank you to Ontario by Bike, and Destination Ontario for sponsoring this trip. Solo Traveler maintains full editorial control over all content on this site.